And it’s big. But what is it all about? What is in it for the slush pile resident? I’ve gone for a few years now, and should fess up at the start that I go with two hats on: wide-eyed writer, and because I work as a library assistant. So I go to things like the Children’s Reading Partners roadshow aimed at library professionals (for some reason, they let me in). So I have another reason to be there. But from the slush pile point of view, I’d say there are three good reasons to go. One is the seminars. This time I went to two, plus the roadshow mentioned above. Where else can you listen to Philip Pullman talk about the importance of prizes in children’s literature, then realize Malorie Blackman is sitting next to you in the audience? Another is it is a great place to meet up with other writers you know, or know on-line – eg SCBWI-ites have done this the last two years. It is funny to meet people you’ve only known on Facebook: sort of like blind dating. A third is really just for the whole experience: to wander past the endless exhibits, see who is who and what they are trying to sell, to get a sense of the scale of the industry we are trying to crack. It is a bit intimidating, but in a good way. Philip Pullman says making the shortlist of a writing competition is an accomplishment; winning is a 'random kindness of providence', dependent on who the judges are and a good dose of chance. 90% of searches done by teens on the internet are not done on Google. They are done on YouTube! Must admit I was very surprised at this statistic. It has obvious implications if you write for teens and want them to find you on line. if I'm going to keep up this blogging thing, carrying my camera around in my bag isn't good enough: it must come out now and then. Sorry about the lack of visuals! it is very entertaining watching how representatives of multiple publishing companies deal with total powerpoint failure. The Children's Reading Partners Roadshow was brilliant again this year, despite the lack of powerpoint. 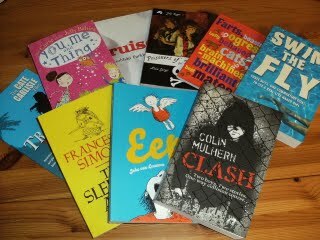 Each of ten publishing company representatives had five minutes to tell an audience of mostly librarians about their favourites of the year, and there was a warning bell if they got carried away. It is always very interesting to hear what they pick to talk about. Some had a long list and a few words on each; some only mentioned a few books; some just one, complete with an author in tow to entertain. I did learn the correct way to peel a banana from Andy Briggs, author of a retelling of the Tarzan legend. New books that particularly stuck out to me? I am dying to read Ultraviolet by R.J. Anderson. And, sadly, Eva Ibbotson's last book is out in May: One Dog and His Boy. And this event was chock full of freebies. This year I sat at the right side of the room - the side with the table of books. I even made the supreme sacrifice of sitting in the front row so I could see what was there, and plan my attack. What I got: books, proofs & sample chapters: hurrah! A final word on the LBF for slush pile residents who may be thinking of going next year: should you come armed with manuscripts? Probably not. Business cards, if you have them? Of course. You never know when you might bump into somebody – an editor in a tea queue, an agent sharing your table at lunch. You might happen along to a publisher's stand just as they have a free minute, and if you're good at schmoozing, it is worth a try. And finally: I just have to comment on Daisy Frost. I can't help myself. 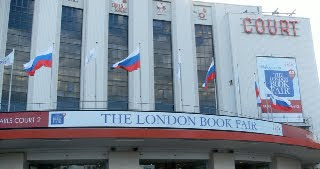 At the end of the Bookseller Daily at the LBF on Tuesday she wrote Agent Provocateur. This is part of what she had to say: 'Outside the rights centre, I spied some badly dressed people holding manuscripts and looking lost. I asked if they needed help. "Yes please - we are authors and we want to get agents. What do we do?" Authors at a book fair? That's like finding a herd of cows going on a daytrip to an abattoir.' And it went on. OK, while my manuscripts were at home, I did spend a reasonable portion of the day getting lost. And I was in my favourite faded jeans, and will even confess to wearing a hoody. But I love books. As a writer I may look at things differently than many of the busy professionals scurrying from appointment to appointment at the LBF. But to me, this is what is important: the book, and the reader. 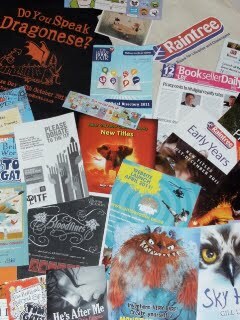 How you get the book to the reader is what the LBF is all about. But where would all the busy professionals be without the book in the first place? And who knows which badly dressed author may be clutching it: the next big thing that they will be scurrying about trying to sell or acquire at next year’s LBF? Glad you had a great time, Teri, and wish I could have gone. Very well said about Daisy Frost: she's sharp and probably sharply dressed but the professionals do often seem to forget that we, the writers, are the producers of the material they rely on. Considering so many writers are questioning the need or function of traditional publishing, maybe DF and her like might make the effort to be more friendly and supportive in future? Thanks for posting Teri. Maybe all the SCBWI people should do one of those 'flash mobs' next year. Just to remind everyone it's about the book. Hm, now off to plan! And a SCBWI flash mob? What an intriguing idea! Faded jeans are still IN, girl! Well, LBF might not have been the best place to show off your MS, but why should authors be banned from looking around and see how the industry works in the first place? Sounds like a great and amazing experience. Hope to attend one day. Hi, I was also at LBF 2011, as a would-be author clutching ms. i did have several interesting meetings that I lined up before I went, and some I made then, though nothing as yet has solidified into marketable contracts, however I was going to say that I remembered the DF quote, reading it on the freebie mag quite cut to the quick, and I ducked out of my final target meeting because of it, but just recently I have had a nice idea to use it for good, so having googled 'london book fair 2011 lost authors clutching' I came here, and glad I did. Thanks for commenting it, and putting out the link, and if this putative idea makes good I will let you know so we can all enjoy!